Seymour Locksmiths based in Shoreham, West Sussex approached Hurley Design Consultants requiring a brand new services based website which would boost their online presence and more effectively interact with potential customers who are looking locksmiths services in the local area. 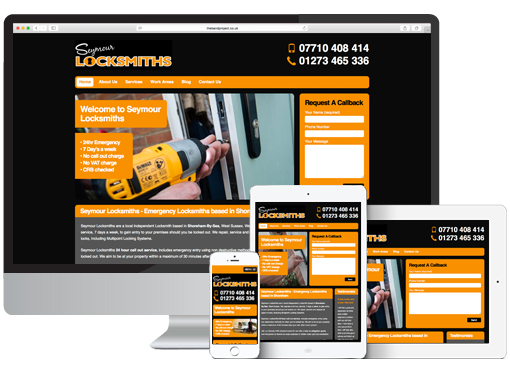 The brief was to design a new content management website which would enhance and complement the Seymour Locksmith current branding. The new website was required to have a contemporary, bespoke design, be SEO friendly, have full CMS ( content management system ) functionality, Blog integration, Google Maps and work areas perimeter integration map and email contact forms. The new website was also required to have user friendly layouts which were responsive to mobile, tablet and desktop. Seymour Locksmiths also required domain registration and web hosting services. I used Hurley Design Consultants because of there professional approach to my business needing a new website. Hurley Design helped me by showing me options for the design of the new website. It was very important for my business that the new website showed high in any search engines. They achieved this by optimising the website to show high in Google listings. Since the new website was launched my workload has increased dramatically. There pricing was very reasonable too. I can fully recommend Hurley Design for doing such a great job from start to finish.